Allied health professionals who are certified function at the top of their scope of practice—bringing a higher level of value and efficiency to healthcare delivery. AMT works directly with you to get your employees certified. Our process is fast and efficient and works with you and your employees every step of the way. But we don’t end at certification. Certificants become members, and we help keep them certified and on top of their profession through educational offerings and more. Is the organization reputable with an altruistic purpose? As a not-for-profit professional society with a member-led board of directors, the sole purpose of AMT is serving its members, rather than making a profit. 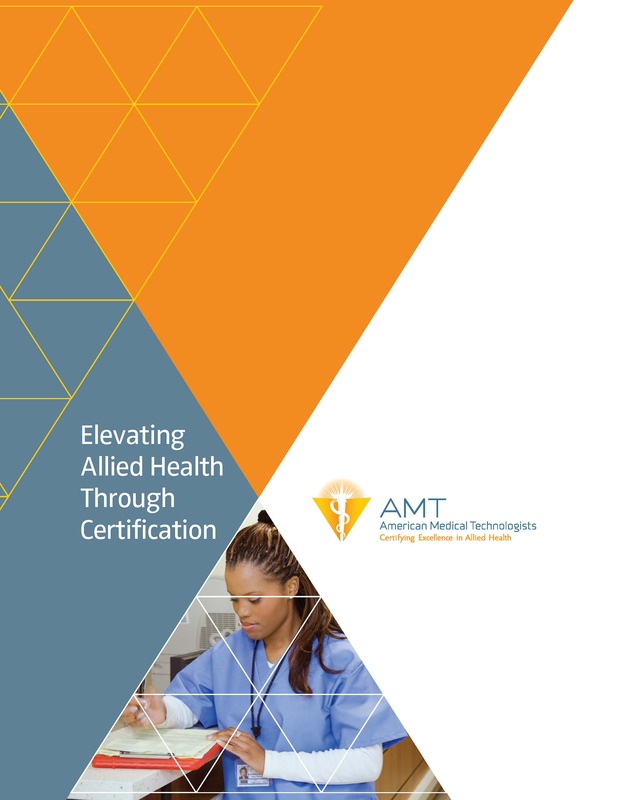 Committed to the allied health profession since 1939, AMT continues to grow with more than 75,000 currently certified members. Moreover, AMT is accredited through NCCA which provides its “seal of approval” only to those who meet the highest and most rigorous standards. Is the certification agency transparent? As a not-for-profit, AMT truly operates on behalf of its members and therefore makes information regarding its certification and membership publicly available. Is the agency easy to do business with? With a strong focus on customer service, AMT has developed a streamlined certification process with a friendly, accessible customer service team to assist if the need arises. AMT also offers exam prep materials, detailed status reports and “bulk purchasing” options. Does the agency ensure that each certified individual meets the stated eligibility requirements? While some agencies manage this process on a random audit basis, AMT carefully reviews applications and verifies supporting documentation to confirm that each and every candidate meets the stated requirements as claimed, thus ensuring that its high standards are consistently met. Are there flexible routes to certification? AMT recognizes the value of real-world experience, which can be applied toward meeting the requirements. AMT offers a “work route” to certification for the medical assistant, phlebotomy technician, medical administrative specialist, medical lab assistant and dental assistant. Does the agency offer national certification that is transportable across state lines? AMT offers certification that is recognized throughout the US and abroad. 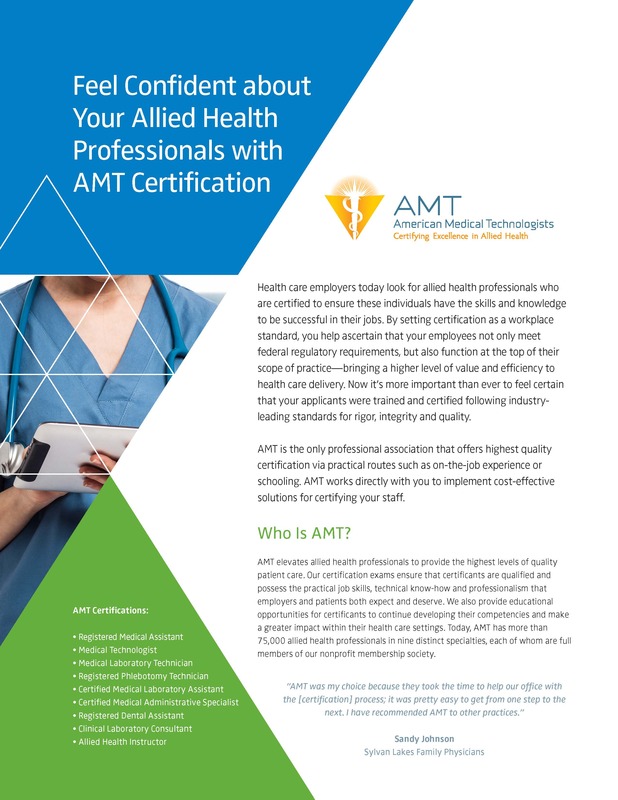 Although some of AMT’s credentials bear the designation Registered, it is important to note that all individuals credentialed by AMT are considered Certified, much like Registered Nurses or Registered Dieticians are certified by their respective boards. Does the exam reflect best practices in psychometrics and credentialing? The exams for AMT certification, which are developed and administered using state-of-the-art methodologies, are managed by our in-house staff of psychometricians and overseen by volunteer subject-matter experts who work in a variety of practice settings. Is the certification exam conducted in a managed, secure environment rather than variable sites with uncontrolled factors? AMT devotes significant resources to maintaining the integrity of each certification exam. 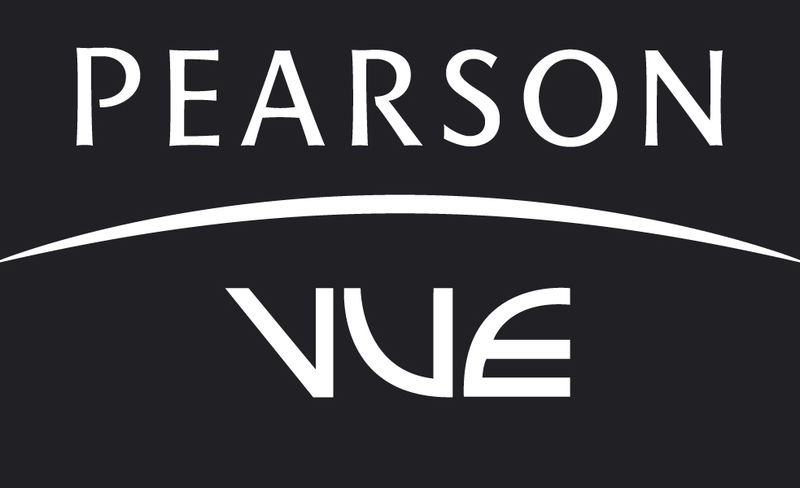 One way is by partnering exclusively with Pearson VUE, a computer-based exam administrator with an international reputation for both security and accessibility. Is the credential affordable and easy to maintain? As part of its mission as a non-profit professional association, AMT consistently has lower costs for certification and certification maintenance compared to other agencies and professional associations. The maintenance requirements are practical for the working individual. AMT can help your non-credentialed medical assistants get certified. Our eligibility requirements allow an individual who has worked as a medical assistant for 5 years or more to qualify to sit for our Registered Medical Assistant (RMA) exam. AMT also offers study tools to increase testing knowledge and confidence. 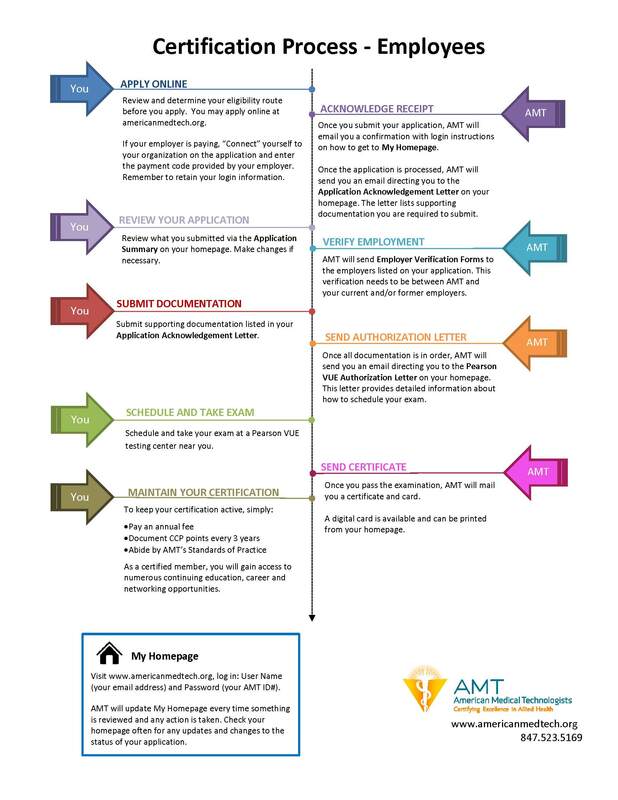 Create an AMT Account Set up an organization account with AMT by contacting the business development department. This step is necessary for when your employees apply for certification– they’ll need to attach their applications to your work-place with your organization ID. This organization account is different than your personal AMT account, which you may or may not have already set up. AMT will connect your personal account with your organization account to show that you are an authorized user of that organization. Applications: You will need to provide them with a coupon code, which you receive through the bulk* purchase. Practice Exams: You will need to provide them with an event code, which you receive via email once you make the bulk* purchase. *The bulk purchase process is used even if you only need to purchase one application or practice exam. Using this process is what generates the coupon code or event code you will need to give your employees. 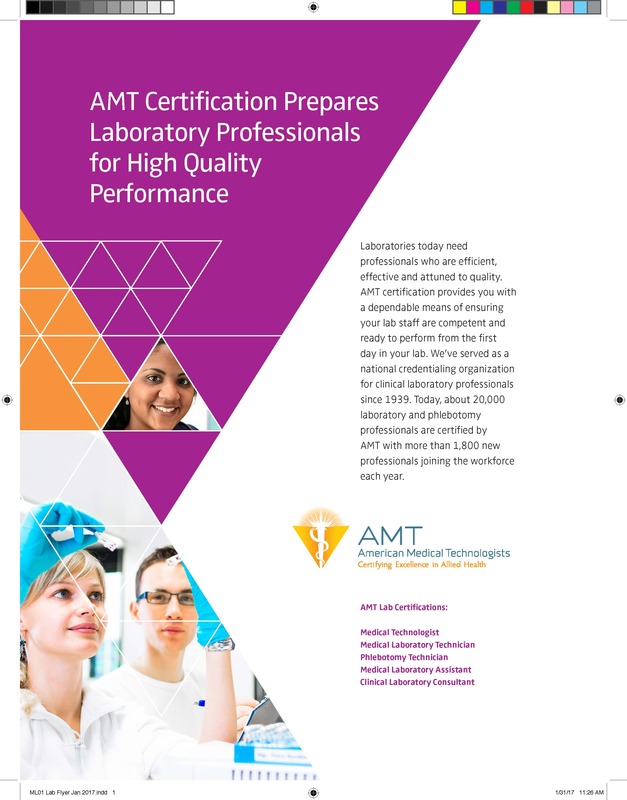 AMT can help your laboratory employees get certified. Our certifications include Medical Technologist MT(AMT), Medical Laboratory Technician MLT(AMT), Phlebotomy Technician RPT(AMT), Medical Laboratory Assistant CMLA(AMT), and Clinical Laboratory Consultant CLC(AMT). Laboratory certification through AMT has a long-standing reputation in the industry for unsurpassed quality—both for our stringent eligibility requirements and for the integrity of our certification exams. AMT’s exam content provides both the depth and breadth of disciplines, similar to other high standard agencies. Our certification is distinguished by flexible and practice-focused eligibility requirements. The minimum requirement to challenge AMT’s MT exam is a BS degree. AMT offers study tools to increase testing knowledge and confidence. As an employer, you want to hire qualified personnel to ensure that your patients get the best care possible. AMT shares in this goal - we promote and maintain a high standard of excellence for allied health professionals and support their role as part of the patient care team. The salaries below are based on 2016 data obtained by the Burea of Labor Statistics. Please note that these salaries do not take into account geographic and practice setting differences, or differences in salary based on training or certification status. Learn more about employment and salary statistics in these Profession Profiles.